Three Sutron RLR-0003-1 water level sensors were tested in laboratory conditions to evaluate the accuracy of the sensor over the manufacturer’s specified operating temperature and distance-to-water ranges. The sensor was also tested for compliance to SDI-12 communication protocol and in field conditions at a U.S. Geological Survey (USGS) streamgaging site. Laboratory results were compared to the manufacturer’s accuracy specification for water level and to the USGS Office of Surface Water (OSW) policy requirement that water level sensors have a measurement uncertainty of no more than 0.01 foot or 0.20 percent of the indicated reading. Except for one sensor, the differences for the temperature testing were within 0.05 foot and the average measurements for the sensors were within the manufacturer’s accuracy specification. Two of the three sensors were within the manufacturer’s specified accuracy and met the USGS accuracy requirements for the laboratory distance to water testing. Three units passed a basic SDI-12 communication compliance test. Water level measurements made by the Sutron RLR-0003-1 during field testing agreed well with those made by the bubbler system and a Design Analysis Associates (DAA) H3613 radar, and they met the USGS accuracy requirements when compared to the wire-weight gage readings. 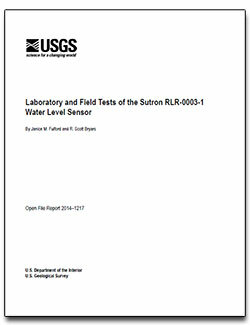 Fulford, J.M., and Bryars, R.S., 2015, Laboratory and field tests of the Sutron RLR-0003-1 water level sensor: U.S. Geological Survey Open-File Report 2014–1217, 20 p., https://dx.doi.org/10.3133/ofr20141217.